Home » Ask The Trainer Blog » Misc » Can CrossFit Training Prepare You for an Obstacle Course Race? CrossFit Training For Obstacle Course Races? Both are very intense forms of activity. CrossFit emphasizes highly intense functional training, while obstacle races feature physical challenges scattered over difficult terrain. 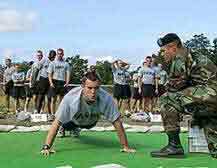 Each have a connection with elite forces.The CrossFit training system has been used by military and law enforcement as well as avid exercisers. The Tough Mudder and Spartan Race were inspired by the challenges taken on by special forces. Organizers reinterpreted these challenges into a rigorous obstacle course. Given the similarities between CrossFit and obstacle racing, is CrossFit a great way to train for an obstacle course race? In order to answer this question, it’s helpful to review the components of CrossFit alongside the demands of an obstacle race. Whether or not these pillars address the specific skills needed for a race will determine CrossFit’s utility. Cardiovascular endurance. Endurance is a must for obstacle course racing. For many of the longer races, you need to train your cardiovascular system to withstand distances close to a half-marathon. Stamina. In contrast to cardiovascular endurance, stamina refers to your body’s ability to tap into energy over time, while cardiovascular endurance focuses on your system’s capacity to harness oxygen for the long haul. For an obstacle race, you need both: endurance for the run and stamina to transition from one obstacle to another over several miles. Flexibility. Flexibility work will help you prevent injuries during your training and on the actual race day. Warming up and cooling down with dynamic and static stretches may also help ease some of the muscle soreness you’ll inevitably feel after the race. Strength. Strength is essentially the ability of your muscles to generate force. To take on the obstacles you’ll encounter during the race, you’ll need strength. For example, monkey bars will require upper body and grip strength while scaling steep hills will call upon leg strength. Power. In contrast to strength, power is the ability to generate force quickly over time, typically short bouts. Although the challenges of an obstacle race may wear you out to the point where you’ll be too tired to generate power, power training is an essential in optimizing sports performance. Power training will enhance many other aspects of your fitness, including strength, stamina, and endurance. Speed. Unlike power, speed has to do with your capacity to complete one move as fast as possible. Training to improve speed by itself may appear to have very little impact on a long obstacle course race. But speed training may help with improving your running pace and the occasional explosiveness you’ll need for an obstacle. Agility. Not all obstacle course races require agility, which can be defined as the ability to change direction rapidly and efficiently. But if you have a zombie-themed or similar race in mind, you may want to work in a few of agility drills in your training. Balance.Balance training is helpful for an obstacle race. Walking/running over unstable surfaces like mud or teetering on narrow beams require good equilibrium. Coordination. There will be times along your race that you’ll have to combine several movements together like walking, balancing, climbing, gripping, pulling, lifting, and others. For example, you may need to lift a heavy object over one shoulder while walking. Coordination can help with this and other tasks. Accuracy. While coordination refers to the ability to combine several moves together, accuracy is basically coordination with precision. For example, in an obstacle race, you may need to cross “over and under” hurdles. Jumping and crouching over these barriers will require both coordination and precision (especially the jumping part!). Overall, nearly all of the components in the CrossFit system are relevant to obstacle race training. So CrossFit can actually help you prepare for an obstacle course race. It can help you meet the demands for strength, endurance, stamina, agility, balance, and coordination necessary for your race. However, if you are a beginner, new to a structured exercise program, CrossFit may be too intense for you. The risk for injury among newcomers is high for many intense activities like CrossFit AND obstacle racing. As a beginner, it may be best to start working one-on-one with a personal trainer that has a background in CrossFit and obstacle race training. If cost is an issue, you can try a fitness program that trains some of the foundations similar to CrossFit such as strength, cardio, power, and flexibility. The popular P90X and other home fitness programs address these components. You can also work on mastering some of the basic movements common to the CrossFit program at home like squats, push-ups, pull-ups, deadlifts, and lunges. But if you have some experience working out and maybe even an obstacle course race or two under your belt, you may want consider giving CrossFit a shot. It may not only get you in race-ready shape, but it may also provide you with a new fitness challenge all by itself!